As in much abstract painting, the viewer searches for content or subject from the mysterious surface. For his solo exhibition Phat Drop, Guillermo Creus presents paintings that encourage this play, providing clues to somewhat recognizable, familiar shapes but ultimately stumping the viewer. The quizzical nature of the forms, however, makes it enjoyable to try. Perhaps it is this perceptual teasing and playful defiance of direct interpretation that are this emerging Williamsburg artist’s greatest strengths. The show’s press release mentions the influence of Kasimir Malevich, a pioneer of Suprematism. Inventing more of a theory than a style, this Russian avant-garde painter presented pure geometric forms against a neutral, often white background. Malevich once wrote, “The object in itself is meaningless … the ideas of the conscious mind are worthless.” In essence he favored “the supremacy of pure feeling.” Though Malevich and Creus differ dramatically as far as the look of their respective paintings, in spirit they are similar in a significant way: both deny objective representation. Creus dispenses with the rigid square and the straight line, opting for organic, imaginative figures. Despite the apparent familiarity of the subjects in Creus’s work, they hold no place in the phenomenological world. Additionally, Creus sets his forms against that clinical white background evident in Malevich’s paintings from the early twentieth century. Most striking of the six canvases at Farrell/Pollack Fine Art is Untitled (all works 2000), which could resemble a human heart ripped from the chest cavity. Crimson and dark red tissue unfolds beneath a top layer of a creamy, skinlike membrane. Painterly drips flow from the interior section like flowing blood. But nowhere in the abject painting is a sense of identification with a human form. Untitled does not probe into a traumatic wound. Rather, it is coolly displayed, almost nonchalantly; it is beauty turned inside out, but still remains beautiful. Dermathopandeia shows more tissuelike folding and, like Untitled, presents brown, pale lavender, and dishwater brown colors underneath another creamy, droopy patch. Thin veins appear in the middle sections. The image again recalls the body or body part, but it doesn’t look human at all. The title refers to scientific nomenclature, so perhaps a concise interpretation of the work can arise simply by looking up the definition of the word. Not so. “Dermathopandeia” is a nonsense word that Creus invented. Consequently, it rouses up the imagination rather than reaches a rational conclusion. Dude is a striking composition in muted lavender and green, although what exactly it is remains elusive. The same goes for Logo. With its rose reds and whites, the bottom section recalls flower petals, but I’ve never seen a blossom shaped quite like this. Logo is a cleaner painting, lacking the painterly drips visible in the others. Creus says this polished look is the direction he is working in now. Two smaller, monochromatic paintings edge toward a purer form of abstraction but tease the eye like the larger canvases. In Painting, a swirling cloud of slate gray covers most of the canvas, with a portion of that white background visible in the upper right corner. The color gradations are sinuous and refined. In contrast, Happier is all white, perhaps the closest of the six paintings in line with Malevich’s pure optical sensation. It could be a microscopic view of the blank space on the fringes of the larger canvases, disclosing that even neutral space can be a smooth, graceful experience. 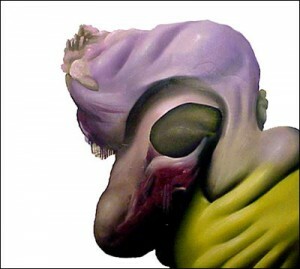 The South American–born Guillermo Creus received his MFA from Columbia University in 1998. Phat Drop is his first solo exhibition in New York. Originally published at Billburg.com in September 2000.